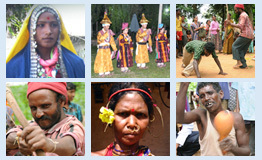 Manda is one of the many languages that are spoken in Odisha. The manda population which is about 4000 is found in kalahandi district of Odisha, India. The population is largely concentrated in villages namely, Kathakura, Pokra, Koshabora, Godra, Dakuta, Moska, Birikot, Gopalpur, Darla, Bissamgiri, Ranipodar, Kumarkani, Domerpodar, Kosavora, Chatrang, Bolangi, Mutachova, Semelpodar, Ramganji, Tesiguda, Dabriguda, Champichuva, Indira Colony, Kanigma, Jamguda, Duliguda of Thuamul Rampur block, Kalahandi Distict. Manda language is spoken by less than 4000 speakers and it is a member of South-Central sub-group of Dravidian family, is considered to be one of the endangered languages in India. The community of the language called as Kondh community. The Kondh word is derived from the Telugu word Konda which means Mountain or Hill, outsiders refer them as Kondh-Parjas. The community people live in the highlands of Thuamul Rampur and they are bilingual having proficiency in their mother tongue as well as Odiya. Hinduism is a common belief practice of the community. This Kondh tribe (30-40 years back) has changed from traditional way of living by hunting to working in agricultural fields, animal formation and wage labor's. Tuki is regarded as the main festival of the Kondh-Parjas. The festival took place in the month of mid October where the mother earth is being worshipped. Presently, an attempt to document Manda Grammar and to produce a Manda-English-Oriya dictionary and Manda ethno linguistic profile is undergoing.